December 7, 1892 –Water is let into the shaft of the new four-mile tunnel at 11:00 a.m. There is no ceremony; a heavy gale buffets the city, and the lake is a mass of angry waves. Still the new fresh water tunnel and lake crib are a remarkable achievement … “One of the most difficult engineering enterprises ever accomplished in America.” [Chicago Daily Tribune, December 8, 1892] The well in the center of the crib, located about 3.3 miles due east of Monroe Harbor, is 75 feet in diameter with a cast-iron shaft, ten feet in diameter, that goes down to a depth of 76 feet. 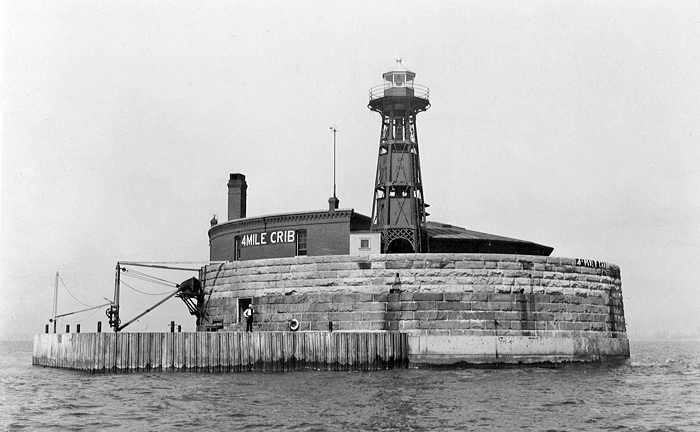 Designed by architect D. H. Hayes, the crib’s construction began in 1887 and is connected to two pumping stations on shore. The whole operation is designed to supply the city with 75 million gallons of water each day. The cost of the project is $1,526,143.68. That’s equivalent to about $40 million today. This will be the second crib that the city builds, this one augmenting an 1865 crib and tunnel that were only two miles offshore, too close to the shore to escape the waves of sewage water that the river disgorged each day into the lake. Today the Four-Mile Crib is inactive and is slated for demolition. December 7, 1879 – Faced with a river that keeps plugging itself up with a pesky sand bar at what should be its mouth, the Chicago Tribune expounds on a three-part plan to remedy the problem. The paper first spells out the specifics of the problem. “In consequence of the drift of sand from the north along the shore and across the mouth of the river,” the article states, “the channel does not run directly out into the lake, but trends to the south, turning around the end of the south pier, passing to Randolph street, thence bending off to the east, forming in its course a channel something like the shape of the letter S, reversed.” [Chicago Tribune, December 7, 1879] The problem grew over time, and the channel became shallower and more difficult “for a schooner to follow such a curvature either in going out or coming in, and when the wind is brisk, it is impossible, without running aground.” To remedy the situation the paper recommends three related actions. First, the south pier should be extended into the lake as far as the north pier. Second, a steam dredge should be put at work full-time to keep a channel of 14 feet that spans the area impacted by the sandbar. Finally, the paper suggests applying to Congress for the authority to levy a tonnage tax or a toll on all vessels entering or departing with the collected money used to make necessary improvements to the river and harbor. 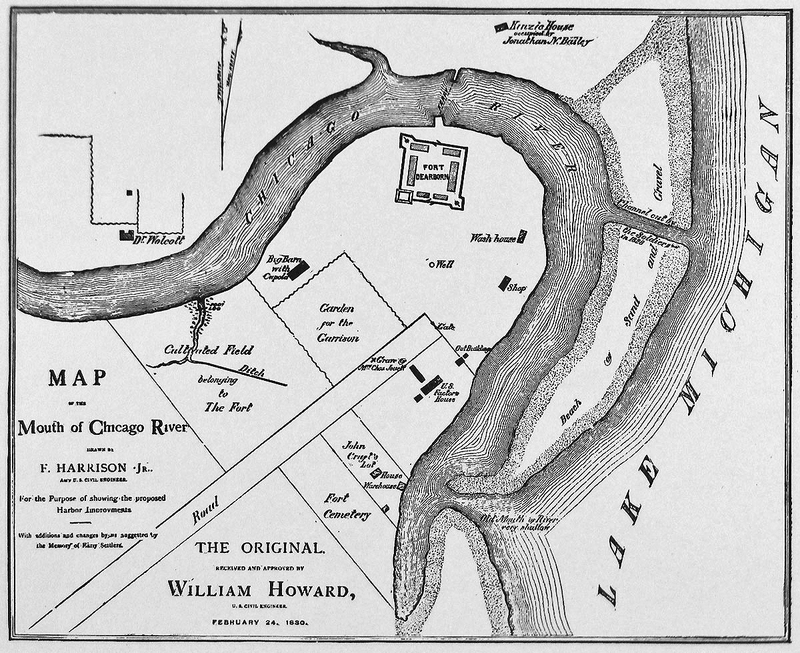 The logic of the plan is pretty obvious as the Tribune states, “Nature always makes a river with two banks, and the channel will be found somewhere between hem; but man, in extending the Chicago river into the lake, constructed it with one bank. The north pier was projected some distance into the lake, but the south pier was cut short; hence, the river has but one bank beyond the end of the south pier, and as a consequence, the channel, being no longer confined between two banks, spreads and shallows out to the south.” Extending the south pier would not only prevent the formation of the sandbar, but would also provide a straight entrance from the lake into the channel, eliminating the circuitous route that began nearly a half-mile to the south at Randolph Street. 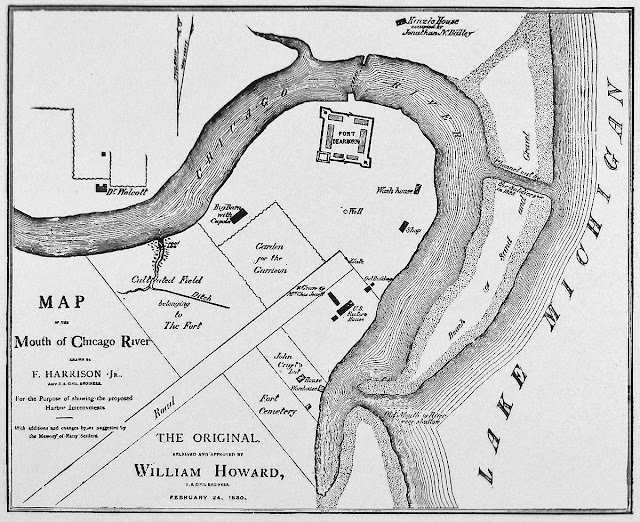 The above map shows the entrance to the river toward the bottom edge that was necessitated by the sandbar toward the top of the map. 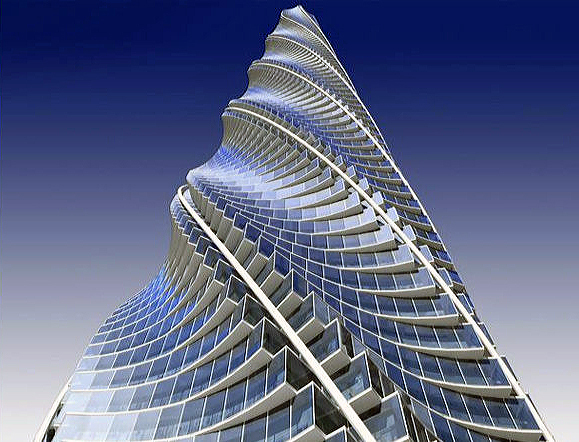 December 7, 2006 – “It’s financial suicide,” says Donald Trump of the updated design for Santiago Calatrava’s 2,500-unit Spire in Lakeshore East on this date. Responding to the criticism, James Loewenberg of Magellan Development LLC says, “It’s a great project if they can pull off the numbers.” [Chicago Tribune, Decmber 8, 2006] One of Magellan’s own buildings near Millennium Park has units selling for $350 to $650 a square foot. The Spire at this point has sold 1,300 units for at least $1,000 a square foot. The new design for the Spire will maintain the 2,000-foot height, but it will take the building to 160 stories rather than the 115 originally projected with seven levels of underground parking. Gail Lissner, vice-president of Appraisal Research Counselors, looks at the project’s future by saying, “This could be a very long sellout unless they find other buyers nationally and internationally. Clearly, the Chicago market would have a great deal of difficulty absorbing them.” With a half-dozen high-end condominium projects currently under construction, the road will be a difficult one for the tall tower at the river’s mouth. Loewenberg says, “It will be a struggle, and only those with the best location and product will survive.” The Spire had a great location and an exceptional product, but really bad timing. As the real estate market collapsed in 2007, the project died as the economy cratered.